People all round the world will be celebrating Shakespeare’s birthday today, 23rd April. This year we in the UK welcome productions of Shakespeare’s plays in many languages from all parts of the world as part of the Cultural Olympiad. Even though these plays were written for English theatre audiences over 400 years ago, they still remind all of us of our common humanity. I can’t possibly add anything to the mountain of writings which try to define what is so great about Shakespeare, so I’ll mention two things I love about his work. First of all there’s the power of his imagination and the boldness with which he expresses it. His work has inspired writers, artists and musicians to create their own often outstanding work from at least the eighteenth century. It’s almost a year since I started The Shakespeare blog, www.theshakespeareblog.com. I had no idea what to expect. Would anybody other than a few loyal friends want to read it? The internet isn’t exactly short of people writing about Shakespeare. So its success has surprised me: well over 25,000 unique visitors from all round the world have read my posts, with over 50,000 page views. Visitors to the site don’t just click on a page and then move off, they stay long enough to read a whole post, and I’ve received an average of three comments for each post, so many I don’t have time to respond individually to everybody who contacts me. I’ve met up with readers at conferences, been sent books for review, been asked for advice, and have helped promote people’s Shakespeare projects. I hope that it’s obvious to readers of my blog that Shakespeare really matters to me. I’ve been able to spend time thinking about Shakespeare from many different angles and have been amazed that so many other people are enthusiastic enough about Shakespeare to put massive amounts of time into creating blogs, videos and educational projects. I’m looking forward to seeing how new technology makes it even easier for people around the world to communicate with each other. On Sunday afternoon I went down to Holy Trinity Church. It was the day after the official celebrations for Shakespeare’s Birthday, and I went to look at his grave and the floral tributes which were placed there the previous day. Formal wreaths carried by dignitaries from all round the world are surrounded by posies made of flowers from the back gardens of local children. 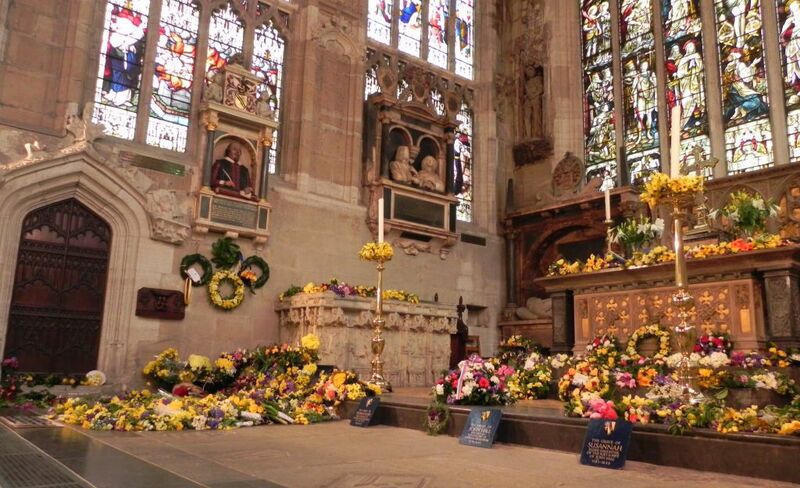 The sight and smell of spring flowers, filling the chancel, makes a real connection between the past and the present. This entry was posted in Legacy, Stratford-upon-Avon and tagged A Midsummer Night's Dream, Happy Birthday Shakespeare, Holy Trinity Church. Bookmark the permalink.